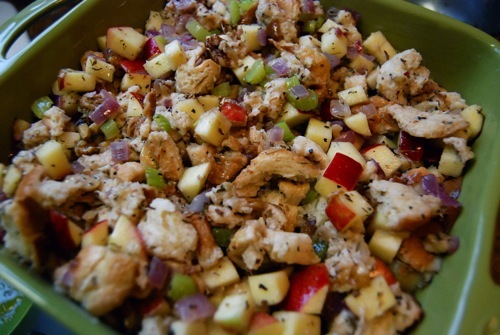 APPLE WEEK is almost over but this is one side dish you’ll want to keep around, especially for the upcoming holidays. While a lot of people (my husband included) are accustomed to having a stuffed turkey, my mom always made our dressing on the side. Maybe it’s a southern thing..? Who knows? But I’m proudly carrying on the tradition. That said, you can of course use this to stuff whatever bird you desire. Or maybe some nice acorn squash? Or… well, you be the artist. NOTE: If you don’t have your own recipe for salt free bread, try mine: Soft White Sandwich Bread. 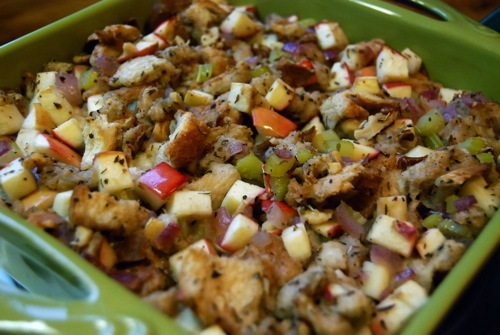 Recipe adapted from “Apple Rice Stuffing” found in Simply in Season. Preheat oven to 350 degrees. Grease an ovenproof baking dish and set aside. Melt butter in a frying pan over medium heat. Add the onion and celery and saute 3-5 minutes, just until tender. Transfer to a large mixing bowl. Add the remaining ingredients and stir to combine. Place mixture into the greased baking dish. Place dish on middle rack in oven and bake for 30 minutes. Remove from oven and serve immediately. NOTE: Stuffing can be made ahead, covered and stored in refrigerator until time to bake. This entry was posted in Side Dishes, Thanksgiving recipes. Bookmark the permalink.